For my sanity, I need to blog. I took this blog offline a while ago. I was feeling... well... vulnerable. And exposed. I had nothing to say and since my sons - especially Willem - are clear about what they want shared and what they don't, I took it all offline. But I've missed it. I've missed it dreadfully. I've missed it when I read someone else's brilliant post. I miss it when something happens that I so badly want to share. I've missed it when I went back and re-read what early life was like with Finleigh. Now there is news. Big news. Earth shattering, life changing news. We finally have a real, true, absolute diagnosis for Finleigh. We know why she is the way she is. And it changes everything. Three months ago, my darling daughter was diagnosed with Smith-Magenis Syndrome. My life, in some ways, has essentially stopped since we received the diagnosis. I'm going through the motions, but I have lost myself. I feel empty inside. Unfulfilled. Lost. And unsure what to do and where to go next. Right now I'm still in that place of mourning. I'm still learning to accept things. So let's recap, shall we? I started this blog 5 1/2 year ago as a weight loss blog. On my journey to lose 100 pounds... which I did (and then gained back 40... but... whatever). It quickly turned into a blog about my kids because I have been a stay-at-home mom and they were my life. And then, as Finleigh got older and it became more apparent that she wasn't typical and she became more difficult, it really turned into a blog about my struggles with her. And my angst. Now? Now, this blog is going to largely be about Smith-Magenis Syndrome. Why? Because its all consuming. And also, because it's very rare and I feel the need to make this syndrome even just a little more well known. 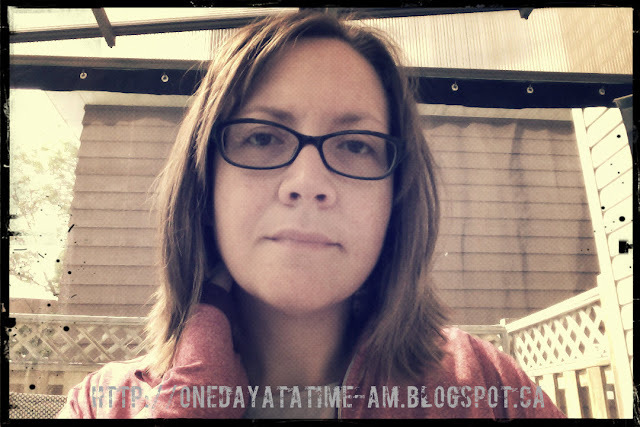 I've batted around the idea of starting a new blog, but I don't want to erase my past. I don't want to start again. I like my blogging presence. I like being Amanda Daybyday. But I'm different now. So, my language will likely not be as clean. And I will not talk about my sons much. Not because I don't love them... but because they want their privacy. And since this is all so new... my angst will still be present. So, here is me today - at this very moment, in fact. Different and yet the same. Take me or leave me. That's all I'll say. holy shemoly! you lost 100 pounds!!!!!!! you inspire me..i am vurrently loosing about 60! !